The U.S. has always been a melting pot of diversity, but never so much as it is right now. 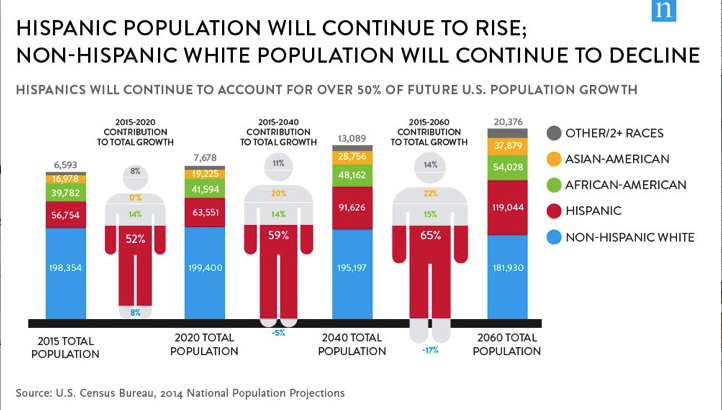 As of the 2014 census, the U.S.’s minority population totaled 37.9%, and in the next five years 80% of the country’s growth will come from minorities. Of that, over half of the growth will be among Hispanics – making their demographic the fastest growing group in the U.S. Not only is the Hispanic segment speedily growing, but the group possesses significant purchasing power – 1.5 trillion per year! Despite these facts, most brands continue to ignore the value of expanding their marketing efforts to target the Hispanic segment. How should your brand target Hispanic consumers? Authentically Connect. Reaching a Hispanic market requires more than simply translating content from English to Spanish. The brand needs to demonstrate they have researched and understand the Hispanic cultural background, behavior, values, and diverse nationalities. These factors are essential to develop a comprehensive strategy that aligns the brand with the Hispanic audience. Be Mobile. Be Social. A Google study on connecting with Hispanics online showed that 68% of the respondents use mobile devices. Also, they spend more time on their phones than non-Hispanics, 10.5 hours per week compared to 8.4 hours. When it comes to social media, Hispanics are active – big time! A study by the Pew Research Center reported that U.S Hispanics represent 75% of total U.S. social media usage. Make It Meaningful. Last, but not least, create meaningful and relevant content. As was mentioned above, creating content geared towards the Hispanic market goes beyond simply translating. Effective content must incorporate Hispanic cultural and social keys to have an impact and generate a connection with the target audience. Bottom line, the numbers don’t lie. 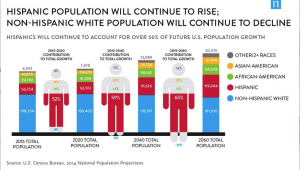 Hispanics are the future leading demographic of the U.S. population and have significant purchasing power. Here at Kazoo, we are experienced in developing media strategies for your brand that effectively reach the Hispanic market and will ensure you capitalize on this growing segment of the consumer economy. -Goldman, Jeremy – Brands That Ignore The Hispanic Market Won’t Survive. Here’s Why.